January 9, 2019 & filed under Longer Content. 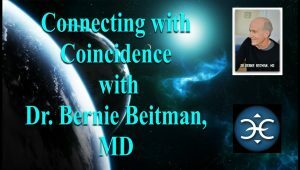 The link below leads to a youtube clip of Chris’s podcast interview with the host of Connecting with Coincidence, Dr Bernie Beitman MD. Dr. Beitman is the first psychiatrist since Carl Jung to attempt to systematize the study of coincidences. He is a Visiting Professor at the University of Virginia and former Chair of the Department of Psychiatry at the University of Missouri-Columbia. He attended Yale Medical School and completed a psychiatric residency at Stanford. Dr. Beitman has received two national awards for his psychotherapy training program and has edited two issues of Psychiatric Annals that focus on coincidences. He is the founder of Coincidence Studies. This interview was released on 22 February 2018.